We are building a machine that has several shafts driven by stepper motors. These shafts need to be synchronized to each other, but at different speeds. We did some research and it looks like a timing belt system will solve our problem, but we don’t know how to proceed with selecting parts. Could you please provide some tips or recommendations? Fred, thanks for your question. With any synchronization project, it’s all about the timing. Let’s start with a brief introduction on timing belts, pulleys, and how they work together. A timing belt is used when the rotation of two different shafts need to be exactly linked. Normal power transmission belts and pulleys are smooth, so the belt can occasionally slip off track (one shaft would be turning while the other remains still). On the other hand, timing belts and pulleys have teeth, which lock the rotation of the shafts and prevent misalignment. In a car, the timing belt links the engine crankshaft to the valve camshaft, thereby making sure that the valves open and close at the correct times. If that belt tears or breaks a tooth, the valves can open at the wrong time and ruin the engine. There are a lot of different variables for belt sizing – width, number of teeth (pitch), material, etc. Each manufacturer will have different recommendations based on your project’s specifications, taking into account shaft speeds, power transmission, environment, and other concerns. 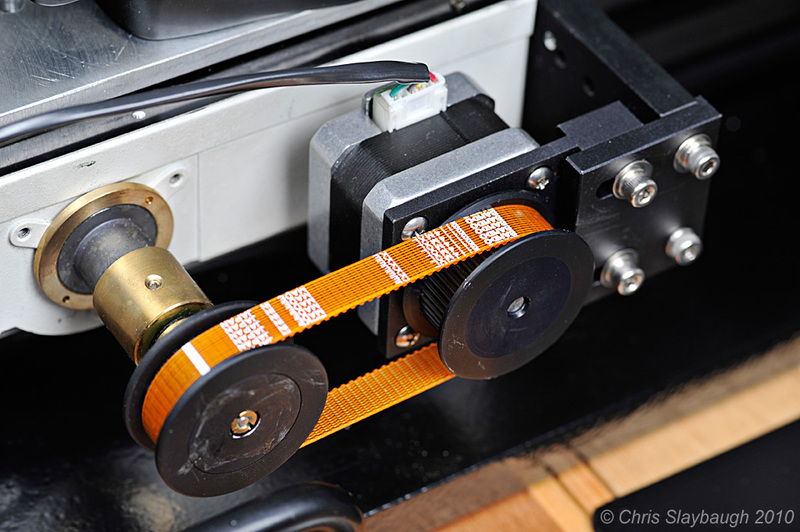 Take care not to needlessly oversize – a larger, stiffer belt can cause difficulties with smaller drive motors. As with any belt and pulley system, you need to identify the rotation ratio between the shafts. For instance, if shaft #1 needs to spin twice as fast as shaft #2, you would have a 2:1 ratio. Once this ratio is calculated, you can then select the pulleys. Looking at the number of teeth on the pulley, find two that match your desired ratio. Continuing with our example, if we had a 16-tooth pulley on shaft #1, we would need a 32-tooth pulley on shaft #2. Note that these formulas don’t take into consideration any pretension on the belt – most recommendations are for 1% – 8%. Belts are only made in certain lengths, so you may need to slightly adjust shaft spacing or pulley diameters to find one that works for you. Now, all of your system components should be in place. We’ve identified the proper belt type based on the system requirements and manufacturer recommendations, sized the pulleys to the correct shaft ratio, and calculated the belt length. Put everything together, and you’ve got a fine tuned machine that will be the envy of all your neighbors! Feel free to leave any comments and questions below, or email one of our experts at engineering@misumiusa.com!